As in Part One, we were in the period of days prior to the Jewish New Year during which we are mindful of the need to reflect on the past year, on situations in which we may have harmed others, and those in which we have been harmed. We make sincere offers of apology and pleas for forgiveness. We open our hearts to accept apology offered to us, and grant forgiveness for trespasses we have endured. Earlier, I spoke about the internal struggle I have had in trying to find a way towards forgiveness of my mother’s abusive, harmful actions towards me. Those actions which were not limited to abuse of a sexual nature, but for many reasons, my perception — my reality — is that it was those that caused the gravest harm to me. I turned 51 in October, and I am only fairly recently moving towards a habituation of love and appreciation for myself and having a relatively balanced sense of comfort in my own skin. I had an expectation of myself after sharing that essay. I anticipated taking a few months to let the feeling of having put it all out there become more natural, after fielding comments from readers both publicly shared and privately messaged. I sat down and began to write no fewer than half a dozen times between December and July, but barely got started before I got stuck and had to walk away. I was doing a lot of emotional work during that time, but I could not get my next set of thoughts to flow. I realized I didn’t know what I wanted to accomplish. I thought, well, maybe that’s all there was? Maybe that’s all I needed to do? It didn’t resonate with me, though, given the rich inner experiences I was having around healing. Then, with a head of hair full of Pert shampoo, I began to reflect on some work done by Desmond Tutu and his daughter Mpho Tutu. The Forgiveness Challenge is a sensitive, thoughtful, and structured approach to forgiveness. I shall not spend a lot of time describing their work, but I will share the link and encourage you to check it out. It is eye-opening and potentially life changing healing work from two people who know more than a little about the need to forgive. I am in the process of working through the steps, and I read a few pages of their related (but not required) book, The Book of Forgiving. Just prior to my introduction to The Forgiveness Challenge, I had engaged in a series of sessions with a local and very skilled practitioner of Emotional Freedom Technique. I am generally skeptical about such alternative techniques that make claims that cannot readily be scientifically defended. I suspended judgment because I was curious about it after having a long conversation with the practitioner in an unrelated setting, and because I was in a lot of pain and the idea of freeing up some of that stuff that was holding me back was very tempting. In the end, I found it to be unexpectedly helpful, in that it gave me some language and tools to use to reorient myself and focus my responses to my emotional reactions. As I rinsed out my hair (which I’m allowing to grow longer and wilder by the day) and thought about these different experiences of not merely thinking about forgiveness, but building the skills I seem to lack around relationships, I had a sudden realization that the next part, and the next essay, would relate the complexity of Trust and Desire in the context of healing from abuse, and about how it is about nothing less than forgiveness: what it is, what it looks like and feels like, and how the process of forgiving another for serious transgressions such as child abuse, spousal abuse, and hate crimes, is as much about building the framework for healing oneself from the damage of shame, guilt, layers of secrets, and self-loathing as it is about freeing the other from the shackles they wear as a result of their crimes — both metaphorical and (occasionally) literal. For this essay I have borrowed (with permission) a photo taken by friend and nature photographer Eric Abernethy. He has done some remarkable photographic work with birds, turtles, beavers, and a host of others on Lake Lucas, and more recently wanders deep in the Sandhills region of North Carolina capturing phenomenal images of snakes, frogs, and other delights. It’s his imagery from the lake that resonates so strongly for me around this subject: in the first essay, the mirror work from the dark places, swimming deep and desperate for a lungful of air. 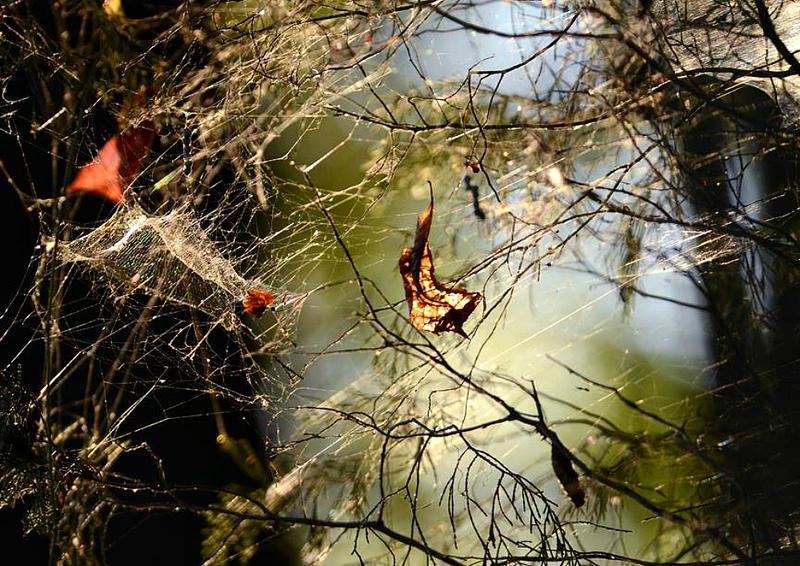 In this, a tangle of thatch, leaves, webs. Yet there is sunlight shining through the in-between places. I get the sense of coming up for air: still not in the clear but there is ample reason to be hopeful. The surface is about to be broken. Read Part One of Deborah’s story. Both essays originally appeared on the author’s website and are reprinted here with permission. Deborah Marcus is a writer and photographer currently living in Asheboro, NC. A NYC native, she is most at home wandering the woods, streams, and country roads in the South. She works as a care coordinator for low income and chronically ill adults. A bilateral cochlear implant deaf and “hearing again” woman, she advocates for accessibility for the hard of hearing. Visit her website.